Posted August 28th, 2016 by Mike Boyes & filed under Abnormal Psychology, Adult Development and Aging, Development of the Self, Health Psychology, Industrial Organizational Psychlology, Motivation-Emotion, Psychological Health, Research Methods, Stress Coping - Health. Description: If you have a job with which you report a very low level of satisfaction it is likely the case that that job is causing you stress and anxiety. What do you think the long-term effects would be staying in that job for 10 to 20 years? The article linked below talks about a study that was done looking at over 6000 individuals participating in a national longitudinal study compared their level of job satisfaction through their 20s and 30s with the risk of mental health problems in their 40s. People with low job satisfaction in their 20s and 30s have higher risks of mental health problems in their 40s. 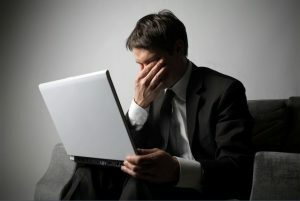 Before you read the article, think a little bit about what additional data you might want to see before you begin to speculate as to possible causal connections between job satisfaction and downstream mental health issues. Source: Mental Toll of Bad Jobs Lasts Decades, Greg Uyeno, Life Science, Human Nature. The dissertation study described in the article found a relationship between level of job satisfaction over the first two decades of one’s work-life and levels of risk for mental health issues in one’s 40s. What data related questions did you come up with that might help us if we want to clarify the nature of this relationship and consider the possibility that there may or may not be causal connections at work here? The finding that people who moved from a high level of job satisfaction towards a lower level of job satisfaction over the first two decades of work life did not have elevated levels of risk for mental health issues seems to at least partially rule out the possibility that mental-health issues are due to current job satisfaction. However, what did you come up with in the way of potential correlates (other unmeasured factors) associated with low job satisfaction, or more specifically, working in jobs that provide low levels of satisfaction? In other words, what limitations did you come up with in relation to the study described in the linked article? The key is to think about what comparators must be held constant if the finding of a connection between job satisfaction and later mental health risk can even begin to be tentatively described as direct. Think of it this way, what differences might exist between two people in their early 20s one of whom is taking up a job with a promising career path and another was taking a job at a fast food franchise? What sorts of questions did you come up with before reading the article when thinking about the possible ways in which job satisfaction might relate to longitudinally downstream levels of mental health risk? What sorts of questions did you think that the researchers should’ve asked when trying to understand the relationship between job satisfaction and mental health risk? How would you design a subsequent study in order to address the questions you raised in items one and two above? Bowling, N. A., Eschleman, K. J., & Wang, Q. (2010). A meta‐analytic examination of the relationship between job satisfaction and subjective well‐being. Journal of Occupational and Organizational Psychology, 83(4), 915-934.